My chief complaint is that it is not suitable for doing comics, yet every brain-dead newspaper graphics person in the world uses it as the default font when they are laying out a ad for a comic book event. Then I have to give each one a schooling. “How can it not be for comics, if It’s called COMIC SANS?” they cry. “Have you ever seen a comic book, or have you ever looked at a comic strip like the ones they run in YOUR OWN NEWSPAPER?”, I Say. “Does any of the lettering you see in those strips remotely resemble Microsoft Comic Sans?”, I ask. “Well, er, no.” They allow. I’ve had to go through this countless times. Now I just nip it in the bud and discuss fonts in advance and tell them that MSCS is strictly prohibited. Perhaps if you wanted to show a little kid who was trying to do comic book lettering it would do. Otherwise, it’s useless for any purpose. Remember the “Extrosion” Comic Con in Las Vegas? Remember what a disaster that was? I knew in advance that it would fail. They used Comic Sans for their logo. That was enough evidence to know that the whole enterprise was doomed from the start. Comic Sans is not for comics. It needs a name change. The proliferation of Comic Sans is something of a fluke. In 1994, Mr. Connare was working on a team at Microsoft creating software that consumers eventually would use on home PCs. His designer’s sensibilities were shocked, he says, when, one afternoon, he opened a test version of a program called Microsoft Bob for children and new computer users. The welcome screen showed a cartoon dog named Rover speaking in a text bubble. The message appeared in the ever-so-sedate Times New Roman font. Mr. Connare says he pulled out the two comic books he had in his office, “The Dark Knight Returns” and “Watchmen,” and got to work, inspired by the lettering and using his mouse to draw on a computer screen. Within a week, he had designed his legacy. There are many things about the Comic Sans font which make it wrong for comics, and I’ll get to them, but first, let’s compare most of the alphabets from Connare’s two sources with the font. In the left column are characters scanned from WATCHMEN, lettering by Dave Gibbons. In the middle are characters from THE DARK KNIGHT RETURNS, lettering by John Costanza. At the right are characters from Comic Sans. Keep in mind that the first two columns are many times removed from the actual original hand-lettering, and are further reduced in quality by my scanning it at a low enough resolution to use here. That said, I see much more style and consistency in both Dave and John’s letterforms than in Comic Sans, the result of many years of practice. Add in the fact that Connare created his letters by drawing them with a mouse on a computer screen, a notoriously difficult way to draw anything, and you can understand why they look the way they do. You can sit anyone down in front of a printed alphabet and ask them to copy it, but the result isn’t likely to look nearly as good as the original. Make them draw with clumsy tools, and the result will be even worse. Not bad looking ones, actually, I like them better than the upper case. There are certainly comics fonts that use lower case, but the vast majority of comics throughout their history have used all upper-case letters. Another thing comics lettering usually requires is a way to show emphasis, generally using a Bold Italic version of the same alphabet. Above are emphasized words from Dave and John from the two comics sampled. John’s is a lot thinner and less bold, but still works to set it apart in context. The only option in Comic Sans is the Bold version, which is the same alphabet made a little thicker and heavier. Not really enough of a difference to work well. And, look at the huge gap between the T and A in TANGLED, an indication that the font was never kerned correctly, something required for good design with any font. Comic Sans fails on every level, and I think deserves the scorn it’s gotten. Only the fact that it comes with so many Microsoft products, making it easy for the design deaf to turn to, has kept it prevalent. Computer users beware, Comic Sans is nothing more than a way to label yourself clueless about comics, fonts, and good design. This entry was posted in Lettering/Fonts on April 18, 2009 by Todd. I use Comic Sans every chance I get. I prefer it, mainly becuse the obnoxious twits who “hate” it get irked when I do. They will just have to get over themselves. Comic Sans will *never* get banned, so get used to it. Thank you for the thoughtful article: Comic Sans Font Examined. I am curious as to where you stand on other fonts aside from Comic Sans in place of hand lettering in general? I can’t glean from the article as to how you might feel about a well designed font and its use in comics. And what about fonts that are created by the letterer him or herself from their own hand lettering — would that change the equation in any way? Comics fonts designed for that purpose are fine, I use mine all the time. 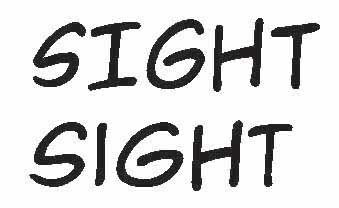 Commercial fonts from Comicraft and Blambot are generally excellent for lettering comics. I had earlier bought the facsimile edition of three Tintin albums – Tintin in America, The Cigars of Pharaoh and The Blue Lotus. These editions were published by Casterman. I have no idea why these guys have decided to use Comic Sans and ruin the presentation. Yes, that looks quite awful.